To all my Tamil speaking friends, Happy Tamil New Year! Ulundhu Vadai / Medhu Vadai is a very common breakfast accompaniment in restaurants in Chennai. Who can forget the famous Pongal - Medhu Vadai or Idli - Medhu Vadai combination? For some reason, our daily breakfast never included medhu vadai . It was reserved for festivals, as part of Padaiyal. In spite of being a straight-forward recipe with just a few ingredients, this could easily become a very difficult-to-master dish, particularly in shaping the fritters. One tip I learnt from a friend of mine, is to let the batter sit for at least 30 minutes before you shape the fritters. Whole, skinless Urad Dal is soaked anywhere from 30 minutes to 4 hours and then ground into a very thick batter with spices. After letting this batter proof on the countertop for some time, small round discs with a hole in the middle are made and deep fried to golden perfection. To shape the fritters, you need a flat surface. What you use is up to you. The traditional way is to use a piece of plantain leaf. This made perfect sense when most homes had a banana/plantain tree in the backyard. The second common way is to use a piece of plastic sheeting like a ziploc bag. Apart from these I have seen people use the back of a small plate, aluminum foil folded into a firm square etc. I just use the palm of my left hand as the flat surface and shape the fritters with my right hand's fingers. Wash the urad dal sparingly with very little water. Soak the washed urad dal in just enough water to cover the top of the dal. Leave undisturbed for a minimum of 30 minutes, maximum of 4 hours. Grind urad dal, green chilies, ginger and curry leaves to a very thick batter. When fully done, the batter will look white, fluffy and very smooth. Sprinkle water as needed. Do not pour water; it will always be more that what's needed! Add asafetida and whole black pepper (optional) to this batter. Do not add salt yet. Let this sit on the countertop until you are ready to deep fry the fritters. This helps in proofing the batter so you get plump vadais that are easy to shape. Meanwhile, finely chop the onion and cilantro. When you are ready to start deep frying, start a dutch oven or kadai , filled halfway with oil, on medium high heat. Line a plate with paper towel and keep it handy. Mix the chopped onions, cilantro and salt to the batter. Wet a flat surface with cold water. 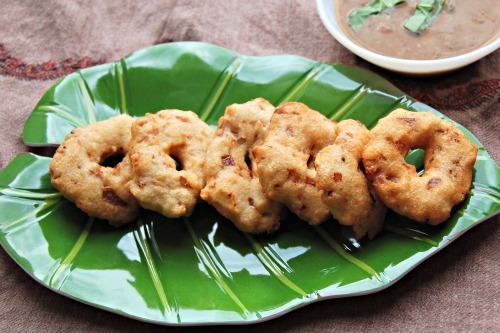 The water acts as a lubricant and helps in removing the shaped vadai easily. Take a Meyer lemon sized ball of dough and place it on the wet flat surface. Using your fingeres , flatten the dough to form a 1/2 inch thick disc. With your index finger, form a hole in the middle of the disc. This helps in even cooking. Wet your fingers again with a little water. In one swift motion, flip the disc from the flat surface to your wet fingeres and into the pot of hot oil. Needless to say, be CAREFUL! The vadai will float back to the surface, almost immediately. Fry the vadais till they are golden brown. Flip the vadais over and fry for another minute. Remove with a slotted spoon and place on the paper towel-lined plate. Repeat steps 8-12 until the batter is done. Serve with chutney/sambar as an appetizer or with rice as a savory side dish. I use the term "batter" very loosely here. It should look like a very wet dough. While frying the vadais, be sure to not crowd the pot. Ensure that the oil is adequately hot. A drop of batter dropped in the oil should float back to the surface immediately. 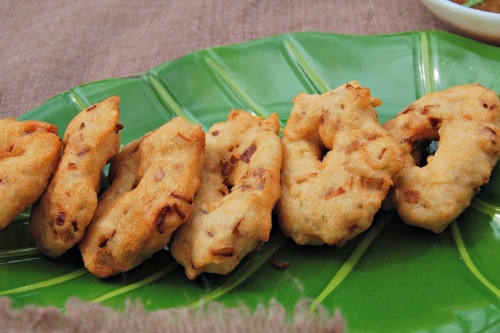 You could optionally add about a tbsp of rice flour to get crispy vadais. If you are feeling adventurous, do not grind the green chilies and ginger. Instead chop them fine and add it to the batter when you add whole peppercorns. 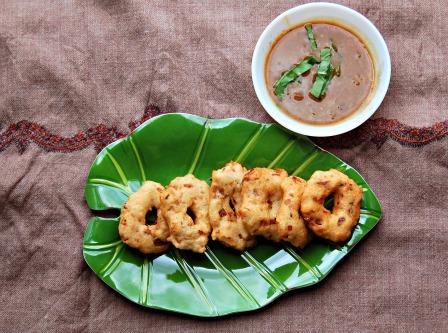 Delicious ulundu vadai I love to have with my tea. Wishing you and family a happy and prosperous new year. Yumm! Love the crispy Vadai!